Students in Art History and Communication Studies are active in curating exhibitions and organizing conferences through Canvas Journal, Fridge Door Gallery, AHCSSA, as well as AHCS courses. For future events, check back regularly or follow us on Facebook. 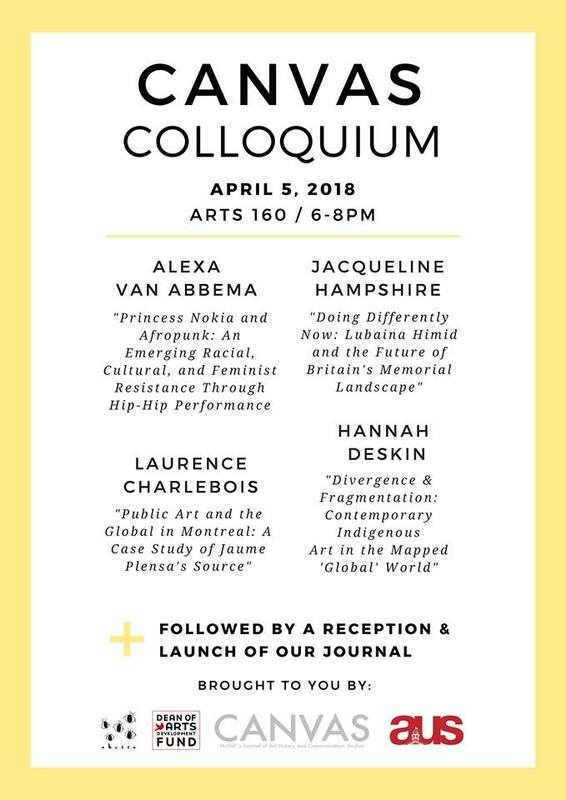 Canvas, McGill's undergraduate journal of Art History and Communication Studies, is hosting our annual spring research colloquium and journal launch! Join us on April 5th at 6PM for paper presentations by three authors, followed by a wine and cheese with free copies of the journal. Non alcoholic and vegan options available! Presentations: In “Furnishing History,” Margaux Shraiman explores issues of authenticity and contemporary curatorial practice at the Palace of Versailles. Catherine LaRivière deals with embodied experiences of viewing and art-making in the light and space installations of James Turrell. Hannah Deskin’s “What a City Remembers” addresses the histories presented by Montreal’s publicly-funded Cité Mémoire project. 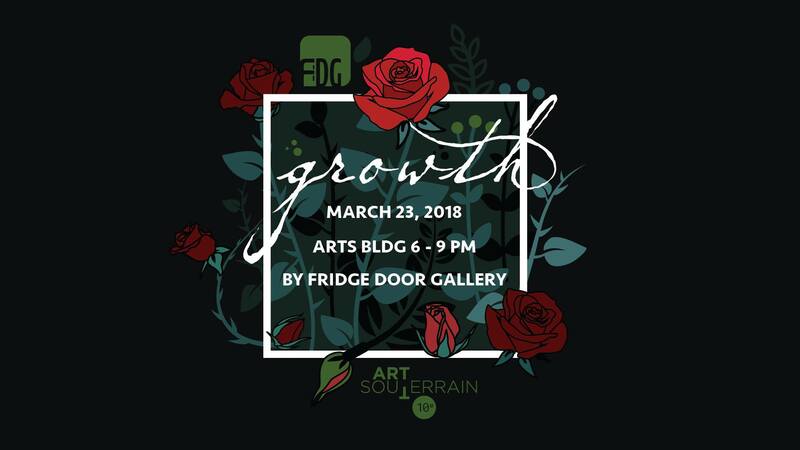 Turning our focus to feelings of warmth and the solace of the genuine, this semester the Fridge Door Gallery seeks to bring you back to the comfort of home. We will be featuring artworks in various mediums that focus on the idea of what makes people feel at home, whether spatially or within themselves. The Fridge Door Gallery launch their first print journal. The print version of The Fridge Door Review will feature the best of our writing team's articles that you've seen on our website, plus some student art! ​Four research presentations by published students, followed by a wine and cheese launch for the 17th printed edition of Canvas. Alexa van Abbema - "Princess Nokia and AfroPunk: An Emerging Racial, Cultural, and Feminist Resistance through Hip-Hop Performance"
Laurence Charlebois - "Public Art and the Global in Montreal: A Case Study of Jaume Plensa’s Source"
Jacqueline Hampshire - "Doing Differently Now: Lubaina Himid and the Future of Britain’s Memorial Landscape"
Hannah Deskin - "Divergence & Fragmentation: Contemporary Indigenous Art in the Mapped 'Global' World"
In collaboration with the Art Souterrain festival, The Fridge Door Gallery presents its spring vernissage, Growth, as an examination of the multi-faceted nature of growth, touching on the many kinds of labor associated with the act of growing. As part of Festival Art Souterrain’s 2018 iteration, Labor Improbus, and taking inspiration from McGill University’s motto “Grandescunt Aucta Labore”, we seek to examine the role of work and growth in our daily lives. How do we as individuals and communities grow through and because of work? As a student-run and student-art based exhibition, we are emphasizing the importance of the university in growing and shaping students. We want to open a dialogue between the University space and art, questioning the relationship between growth, art, and schooling, and the ways in which they intersect. In utilizing classrooms to exhibit the artwork, we are reclaiming the spaces used for learning as spaces for the display of art, ultimately celebrating the artistic practices found on the fringes of the University and giving them their space within an otherwise academic locale. This helps to close the gap between the continually strong presence of McGill’s student artists and the University’s lack of a Fine Arts department. The first annual Canvas Undergraduate Colloquium, hosted by Canvas: McGill's Undergraduate Journal of Art History and Communication Studies, featured research presentations from AHCS students, followed by a wine and cheese. The event launched the 16th printed edition of Canvas. Elena Lin - "L'Infiniment Petit and Monstrous Social Anxieties: Envisioning Disease in Fin de Siècle Culture Through the Eyes of Odilon Redon"
Sylvie Schwartz - "History and Social Consciousness in the Medium and Material of Kara Walker's Silhouette Installations"
Quinn Lazenby - "Zero Feet Away: How Grindr Has Impacted the Gay Community"
Erika Kindsfather - "Between Memory and Progress: Negotiating Infrastructure and Innovation in the Nottingham Contemporary Building"
Fridge Door Gallery, McGill’s original student-run art gallery, presented Reveries for Nuit Blanche at McGill. Jack Kerouac once wrote, “the fact that everybody in the world dreams every night ties all mankind together.” Whether it’s a daydream, a nightmare, a desire or a fantasy, dreams are the workings of an individual’s inner mind, a state in-between the real and unreal. In their darkest or their brightest state, dreams can become a true source of inspiration, a way to delve into one’s psyche in order to find deeper meaning or understanding. The Surrealists, inspired by psychoanalysis, used their dreams to tap into their subconscious in order to stimulate their art and writing. For them, the creative potential of someone’s deep, inner workings was much more powerful than that of conscious thought. While art can be used to depict the world around us, it can also be used to formulate and express one’s inner world and visions. Life is short, yet the world goes on around us. We fill our lives with objects of value, prospects of accomplishment and fulfilment, and dreams of success, knowing all too well that at heart we are all just transient beings, that death is inevitable and that all earthly goods and pursuits are fleeting. The Dutch explored these facts with fascination during their golden age of art through painted studies of vanitas. Closer to our time, Damien Hirst’s diamond skull "For The Love of God" acts as a clear memento mori – a reminder of our own mortality. Be it the discovery of a house lost in the woods, the peculiar colour of a fading black eye, or a simple saltine cracker, things disappear to leave room for something new. The cyclical return of these themes in art however, points to the potential of endurance. This exhibition combines a selection of artworks by McGill students, which puts into reconsideration transience and ephemera. Each attempt to capture a moment in time, which the artists felt deserved a second look. We aim for this exhibition to provide a space for viewers to contemplate on these matters, or simply to enjoy the fleeting moment captured by the artists through a variety of media. Viewers will find not only paintings and photography, but also drawing, collage, an audio mix and a performance. As humans, we all hope to one day leave our mark on this planet – to create, produce or do something which can be remembered as ours once we are gone. Art gives life to a lost moment, lets fame or fashion endure in our memories, ultimately reflecting life’s ephemeral yet cyclical nature. This exhibition and the accompanying catalogue emerged from a fourth year undergraduate, Art History course, “Canadian Slavery and its Legacies: a Curatorial Seminar,” taught by Dr. Charmaine Nelson, Associate Professor of Art History. Working with the holdings of the Rare Books and Special Collections Library (McGill University), the students curated an exhibition, assembling a variety of extraordinary art and visual culture objects of direct relevance to Trans Atlantic Slavery. Like the course, the catalogue and exhibition contest the erasure of Canadian participation in the histories of Trans Atlantic Slavery, instead highlighting the role of Canadian art and visual culture in producing, sustaining and resisting the enslavement of people of African descent and Natives in the territories that became Canada.